As an epic fantasy story, Helm, Volume 1 could be compared to works by J.R.R. Tolkien. Robert Louis Malek not only entertains us with elves, unicorns, and dwarfs, but he also includes mystical creatures from multiple regions, uniting them in a cause to save everyone from the Dark One who has returned. Though the elves attempt to mend the relationships the humans had destroyed a millennia ago, they all look to the humans of the Helm to lead and restore the world they had destroyed. With predators being driven from their homes and entering lands and waterways, these different races must pull together to defend what little they have. Generations of mistrust and ignorance will be just as hard to overcome as the demons that are threatening their livelihood. If these races cannot overlook their differences, they will all fall to an enemy they thought had died out. Helm is fast paced and exciting, keeping the reader hanging onto every word. Robert Louis Malek's extensive vocabulary makes Helm an outstanding read and a step above the average novel. I enjoyed how he introduces different creatures one at a time, making it easier to distinguish the predators from the friendlier races. The glossary in the back of the book was quite useful when I had forgotten a person or place. I found the main characters had strong integrity, yet were driven by compassion for their fellow men. I wanted to savor this novel, but Helm is so intense that you end up reading quickly to discover what happens next. 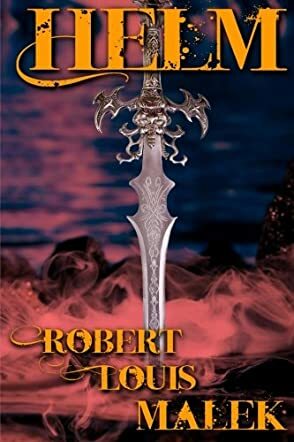 Robert Louis Malek ends this novel by making you wish Helm II: The Saga Continues was in your hands, ready to continue the adventure.